Suzuki education is a teaching method based on the observations of Dr. Shin'ichi Suzuki (1898-1998). He noticed that all children speak their mother tongue at a young age. Not only do they speak difficult languages and dialects, they speak proficiently and with ease. He felt that given a nurturing environment, every child can learn music just as they learn their mother tongue. The Suzuki method is a joyful style of teaching that usually starts with very young children; ideally beginning with introduction of classical music at birth (or even before). Parents are encouraged to pick a piece of music and play it at various times during the day. Within months, infants recognize and react to the piece of music. We begin instrumental instruction as early as four or five years of age. They are the most receptive and enthusiastic at this age, and Suzuki believed that we were losing too much of the child's potential by starting later. A child does not wait until he is eight to speak. The early years are crucial for developing mental processes and muscle coordination. Moreover, if we believe that art and music have the power to nurture the soul and shape the life, the earlier the better. However, it is never too late to begin. Because children usually start so young, parent involvement is essential. A parent, who also acts as a practice partner, always accompanies the child to private and group lessons. At both lessons the parent observes and takes notes to make sure the home practice supports what’s learned in class. Previous musical knowledge from the parent is not at all required, however, as the teacher ensures that parents understand all unfamiliar technical and musical concepts. One parent often learns to play before the child, so that they understand what the child is expected to do. Suzuki parents and children enjoy a special bond that is created when the parent lovingly dedicates time each day to the success and musical excellence of the child. As the child gets much older, the parent involvement becomes less and less, until the only responsibility of the parent is to cheer on their child. Suzuki teachers want to create independent musicians. Since the method is based on the mother tongue approach to learning, the use of reference recordings is essential to the progress of all students. A mother lovingly repeats, “Ma-ma”, carefully mouthing the word in front of her child. Similarly, the Suzuki parent plays certain pieces over and over for the student to actively absorb. Children enjoy repetition and will not tire of the music unless they feel that their parents are bored or irritated. Just as a child acquiring language is surrounded by the spoken word, the Suzuki parent strives to create a musical environment through daily listening to recordings, going to live concerts and hearing other children perform. Suzuki students keep the original pieces learned in their repertoire, reviewing them daily to perfect those skills, which are then used again and again in the subsequent pieces. 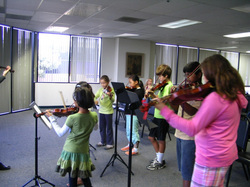 Most traditional styles of teaching are constantly giving a student a new piece. As soon as the child "learns the notes" they are given yet another new and challenging piece to conquer. However, children do not learn a word or a piece of music and then discard it. They add it to their vocabulary or repertoire, gradually increasing their musical fluency and elevating their playing level. Development of musical skills and new techniques is most effective using review pieces that the student can play with ease. This is also helpful in creating a positive atmosphere for performing. Students are always less nervous to perform when they know the piece inside and out. Children learn to read after their ability to talk has been well established. Before she begins first grade and a formalized reading program, the average child has a spoken vocabulary of close to 6,000 words! In the same way, children should develop basic technical competence on their instruments before being taught to read music. A Suzuki program is not complete without group class. Group classes are designed to allow children to share their music with others, while we reinforce important skills introduced at the private lesson. Another function of the group experience is to learn how to play together and support each other’s efforts, developing generosity and community.​ The social benefits of group classes are a tremendous aid in the motivation to practice at home. They also serve as a community for the parents. Group classes are fun! They become an activity that kids and parents eagerly anticipate each week. Lastly, one of the best features of the Suzuki method is its desired results. Dr. Suzuki’s goal was not simply to develop fine musicians, but to help develop children of fine character and noble heart. Do you remember when your child was a baby and said his/her first word? As with language, the child’s efforts to learn an instrument should be met with sincere praise and encouragement. Each child learns at his or her own rate, building on small steps to reach their goals. By recognizing and celebrating the small successes, it is easy to see the potential in every child grow into ability, and blossom into thorough mastery.